Hey guys! 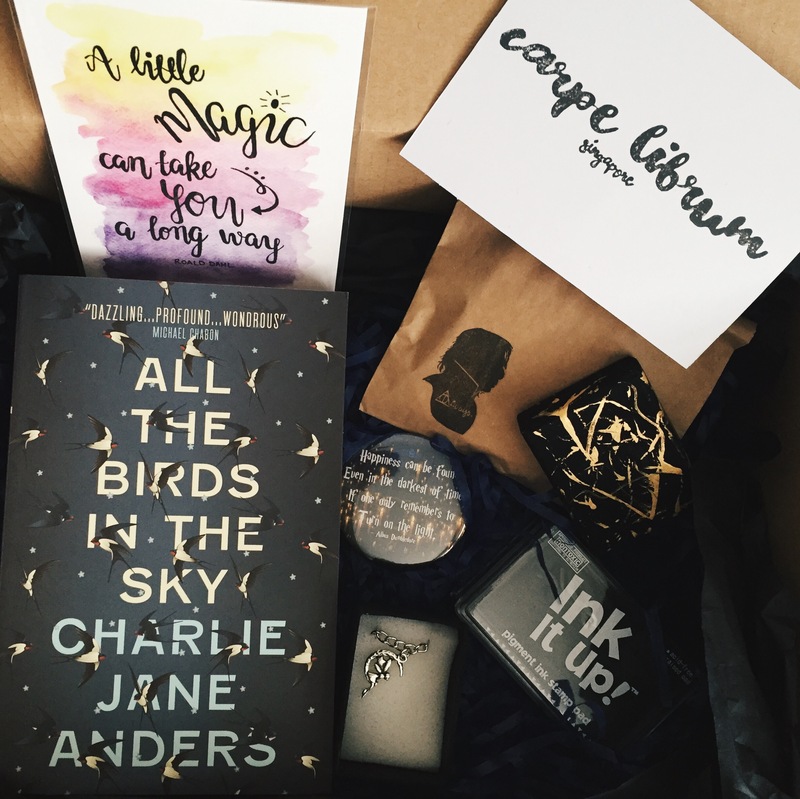 It’s January and Carpe Librum has just released their first book subscription box of 2017! 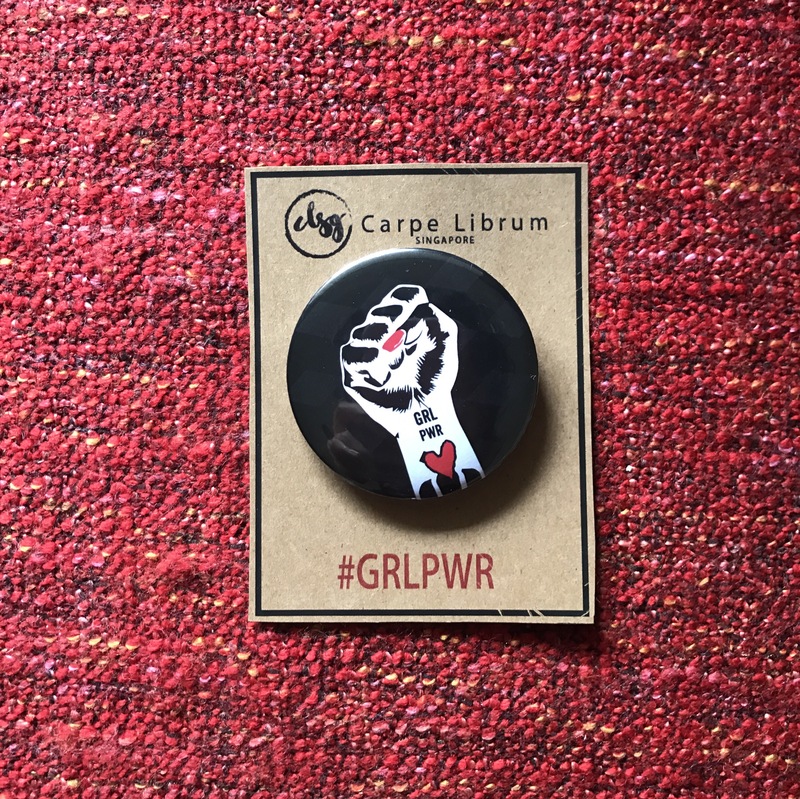 So if you didn’t know, Carpe Librum is a bi-monthly book subscription service that costs $35 (including local shipping)and comes with a novel and a number of other little bookish goodies. This month’s book was a hardback copy Carve The Mark by Veronica Roth. Let me repeat that to make sure you got it. HARDBACK. I was honestly so excited to receive this because it was only released late last week so how cool that they decided to be so current? 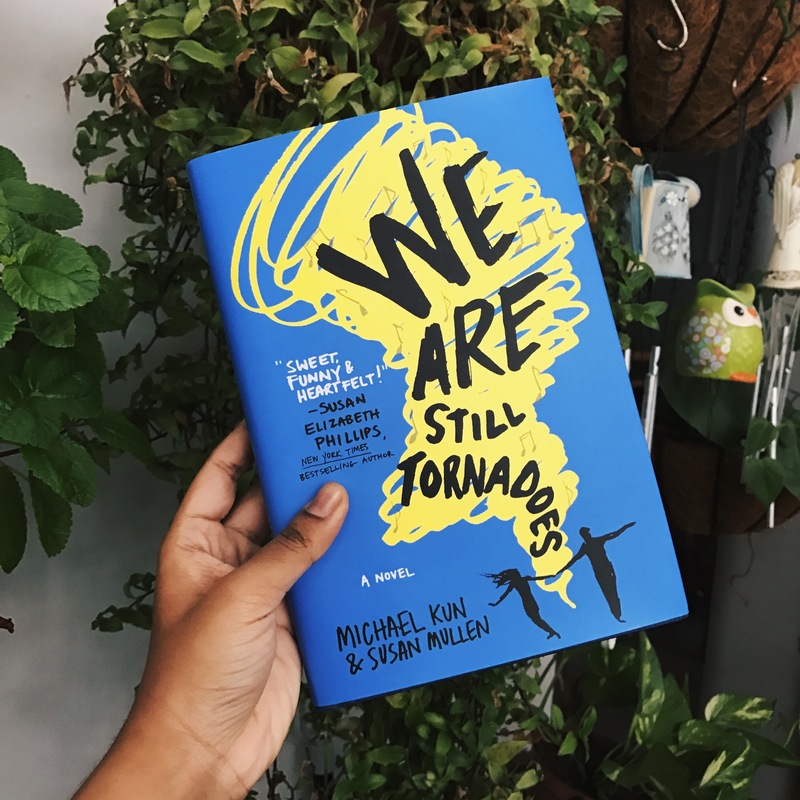 I’m also really digging the fact that they decided to do a Young Adult novel again because you guys know I live for YA and it just really gives the box this added boost that just makes us Singaporean subscribers feel like we aren’t missing out on anything special from the American and Australian book boxes. I feel bad saying this because I’m currently doing a big feature in HYPE magazine about Singaporean authors and their books, but seriously. Getting books that are hyped worldwide is such a treat in a local box in my opinion. Anyway, at this point, I’m sure you have heard just as much as I have about Carve The Mark. There has been so much controversy about this book however I refuse to boycott it until I’ve read it. The internet has just gotten too sensitive to even function anymore jeez. I personally cant wait to get to this book. Okay when I saw that the Carpe Librum team had included a watch in this month’s box, I quite nearly died. I mean seriously. A watch. How. What. Why. The watch is so pretty and I can assure you that I’ll be wearing it for a very long time because it’s really adorable. And the funny thing is that I’ve been thinking of buying a Rosefield watch lately and obviously this is nothing like a Rosefield and I’ll probably still end up buying one but like how funny that this should come in right when I decided I needed a new watch? Just look at this keychain. How mesmerisingly gorgeous is it? Okay actually the picture does not do this justice. Honestly I didn’t think Carpe Librum could impress me anymore with this box after the watch and the book but they did. I am in love with this keychain. Honestly it’s beautiful and I don’t really know where to hang it yet but I’m going to hang it somewhere because it’s a beauty and it’s purple which is my favourite colour. In every box, there is always at least one thing that I don’t quite fancy and unfortunately, it was this candle. Now don’t get me wrong. I love love love scented candles. In fact, when I saw it in the box, I got so excited. Even more so when I saw that it was a Leia soy candle (even though I don’t watch Star Wars). So I opened the tin and I saw the blue wax with the glitter on top and my heart was soaring because GLITTER AND SCENTED CANDLES AND BLUE WAX. But then I took a sniff of it. Now okay I don’t completely hate the smell. I mean really it’s not that bad. But it does have a very medicated oil kind of smell which after I identified it, I couldn’t stop smelling it. 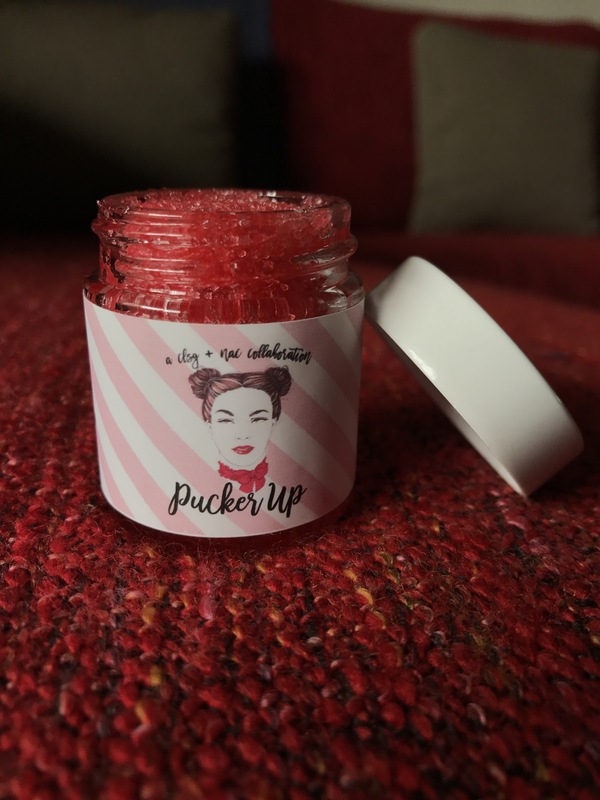 Now obviously everyone likes different scents so maybe if you have smelt this candle before, you might like it. Everyone’s different. I personally didn’t like it. Though I do like looking at the glittery wax so there’s that. The box came with a Carve The Mark bookmark which I think was a nice touch. Nothing remarkable but it’s nice. I love stickers and this month’s box came with three space themed ones. I’m still trying to figure out if they are normal stickers or laptop stickers or if it doesn’t matter. Regardless, I’m in love with them! The designs are gorgeous and the sticker with the quote is literally perfection. It’s actually one of my favourite book quotes so this was a very lovely surprise. I can’t wait to stick them over my stuff. So that’s all that was in this month’s Carpe Librum book box. Honestly guys, I’ve been getting every single one of their boxes for a very long time now and I can truly say that this is their best one yet. I’m not joking or exaggerating at all when I tell you that I screamed and started jumping around in joy when I opened the box. And if you need further proof, I’ll tell you that I was wearing a strapless bra and it fell off. Too much info? Okay I’ll stop. But seriously guys. I am so proud of how far Carpe Librum has come and I truly hope that the incredible standard of this box carries through with the rest of their boxes in 2017. 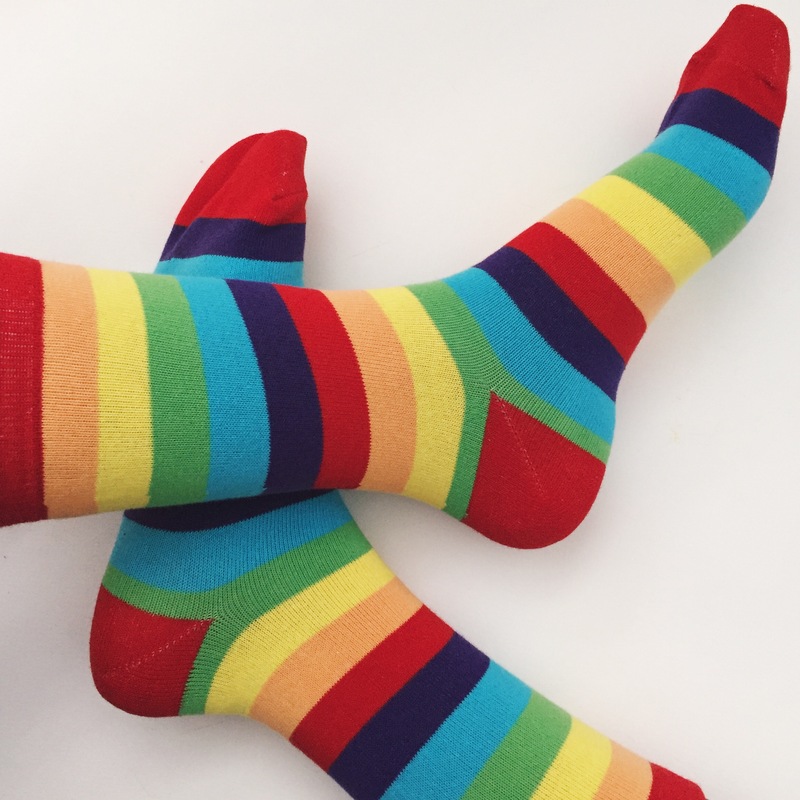 If you want to get your hands on the next box, you can visit Carpe Librum’s Facebook page or their Instagram page to find out more. If you got a box, let me know in the comments what your favourite item was this month. This time, as a Christmas special, Carpe Librum gave us the option of choosing between two themes (or getting both). The themes were: Happiness & Love Yourself. I got the Love Yourself box because obviously. Anyway, today, I will be unboxing it and reviewing each item. Okay I’ll be honest, I read this book and finished it in the week that it was released. But, I read the ebook so I don’t actually have the physical copy and I have been trying to decide if I should just buy the physical copy for the longest time. So this completely solved that problem for me. I can’t wait to put in my shelf right next to my beloved All The Bright Places. Also, if you’re wondering, the book is incredible and a review of it will be going up on Youth.SG next month so I’ll certainly link you guys up as soon as it’s out. Do you even know how much I love tote bags? I love them. And this one is so adorable. I won’t lie, I did wish it came in black because black goes with everything but I love it all the same. And, if you look closely, you’ll see Carpe Librum’s little stamp at the bottom because they actually came up with this themselves. I feel like a proud mama not gonna lie. Ever since Carpe Librum put in a mug in their May book box, I’ve been waiting and waiting for them to put in another mug. I mean I used the last mug religiously every single morning. So I was so excited to open my box and to find a cute little mug. It’s adorable and my only problem is that now I’m going to have such a hard time figuring out if I should use this mug or the mug from May in the mornings. 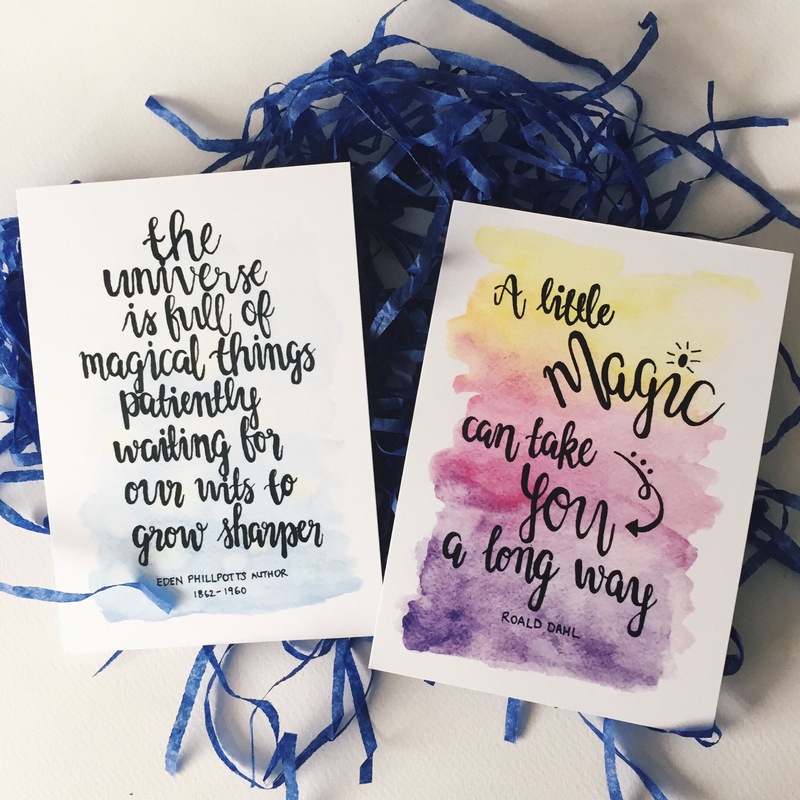 This month, we got six little quote cards with a little wooden stand to prop them up on. I really love these cards. Especially the one that says ‘Eat like you love yourself’. I think that was the best and most powerful line out of all the cards. I don’t know I guess a lot of times we need to remind ourselves that we do actually love ourselves and we should treat ourselves like we would someone we love. I don’t know about you but I would never withhold food from someone I loved. I would never beat someone I loved over the head for a small mistake. So just remember to love yourself. It was such a great reminder. 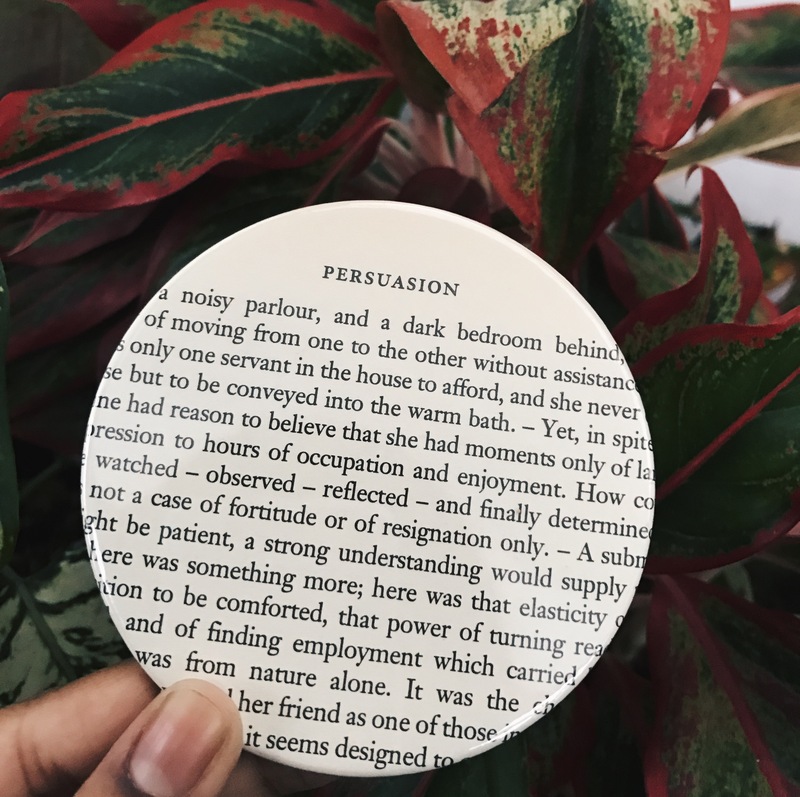 I love coasters and I was so excited to see two of these bookish ones in the box this month. However I am concerned about the quality. The coasters were a little sticky like the paint hadn’t dried properly yet and it just doesn’t look very durable. They are gorgeous no doubt but I don’t think they are too functional. So there you have it. 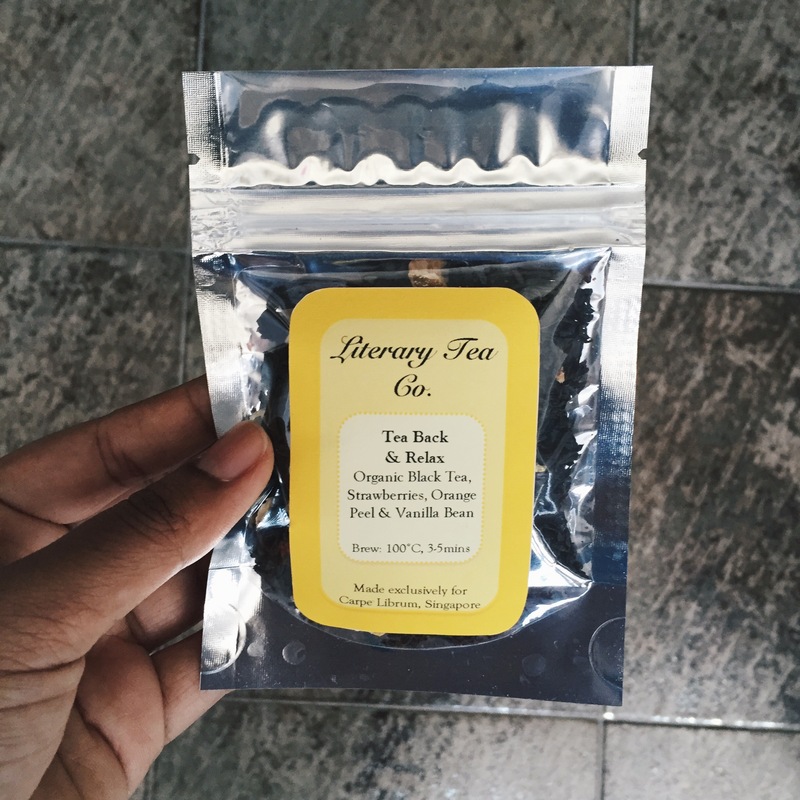 Everything that was in Carpe Librum’s November box. I am honestly so impressed with this month’s selection. I’m so glad that they finally delved into the young adult genre because I’ve personally really been wanting to see that show up in the boxes. I also really like how Carpe Librum experimented with making their own products this time. They usually do a lot of collaborations but this time, I was very excited to see their own little stamps on some of the items. This month, Carpe Librum’s theme was Wanderlust. A box all about travelling and appreciating the world. 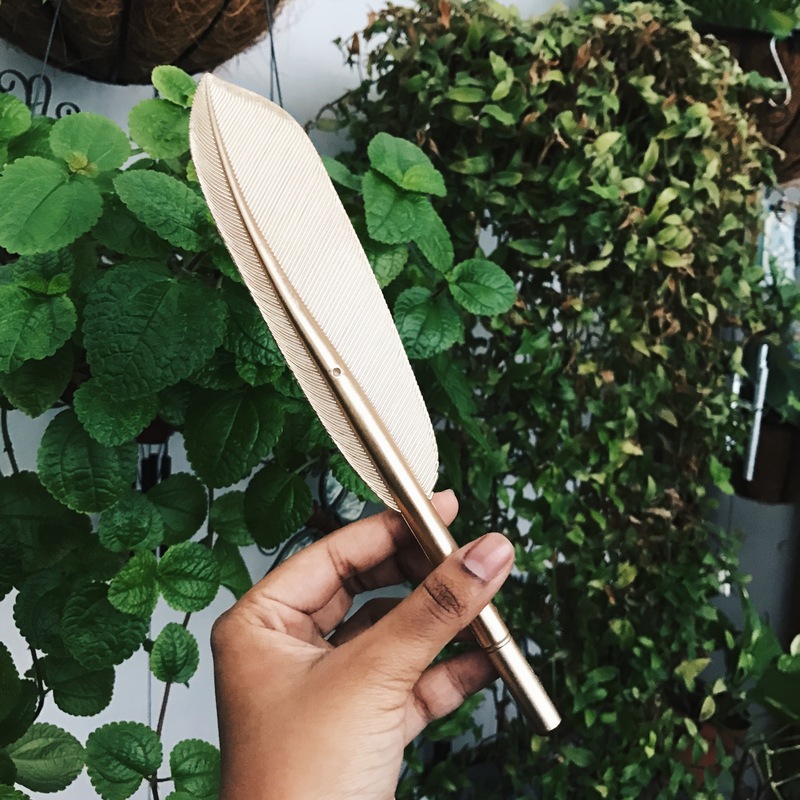 It was curated by Azura and it features a total of six items. Today, I’m going to be unboxing it and reviewing each item for you. In an adventure of a lifetime, Alexander Armstrong wraps up warm and heads ever north to explore the hostile Arctic winter – the glittering landscape of Scandinavia, the isolated islands of Iceland and Greenland, and the final frontier of Canada and Alaska. Along the way he learns from the Marines how to survive sub-zero temperatures by eating for England, takes a white-knuckle drive along a treacherous 800-mile road that’s a river in summer and, with great reluctance, strips off for a dip in the freezing Arctic waters – and that’s all before wrestling Viking-style with a sporting legend called Eva as part of an Icelandic winter festival. This is a non-fiction book by Alexander Armstrong in which he takes us to the Arctic on an incredible adventure. This is the first time that Carpe Librum has included a non-fiction book in their box and I’m so excited to get to it because it just sounds like a very fun read. 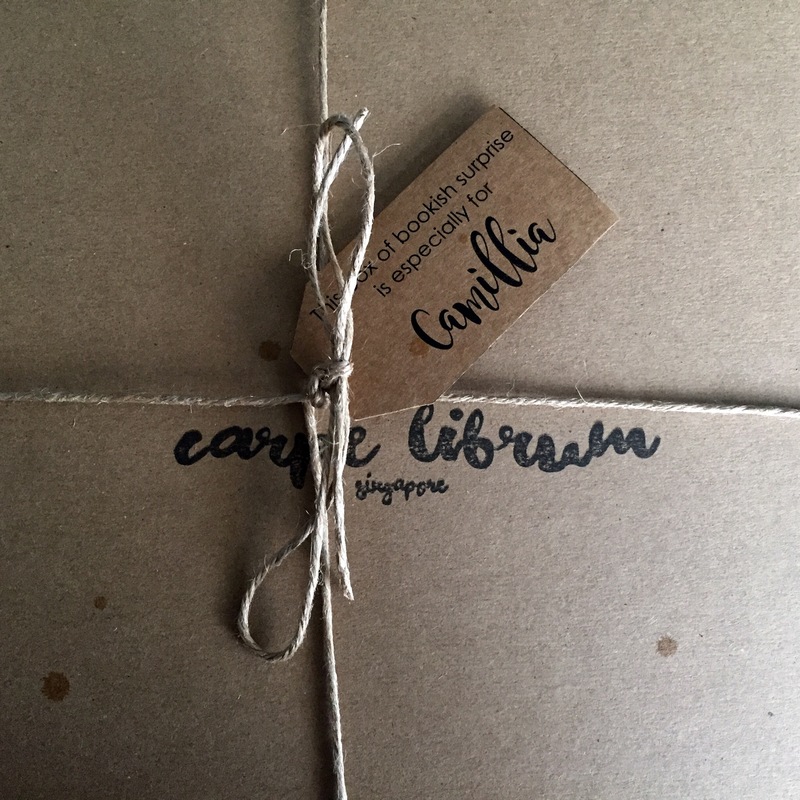 Just like last month, Carpe Librum decided to include a bookmark in their box. This is a magnetic book mark that was made by Craftedvan. I fell in love with it the moment I saw it. However after opening it, I realised that it was actually just cardboard with two magnets glued to it. Terrible quality if I have anything to say about it. However after putting it into one of my books and trying it out, I realised that it actually wasn’t that bad and it was quite durable. So props to them! Now I don’t usually do this but I’m so glad that Carpe Librum introduced us to Craftedvan this month because I checked them out and they literally have the most adorable selection of bookmarks, cards and magnets ever. I completely recommend that you check them out. You can’t have a travel box without a luggage tag can you? 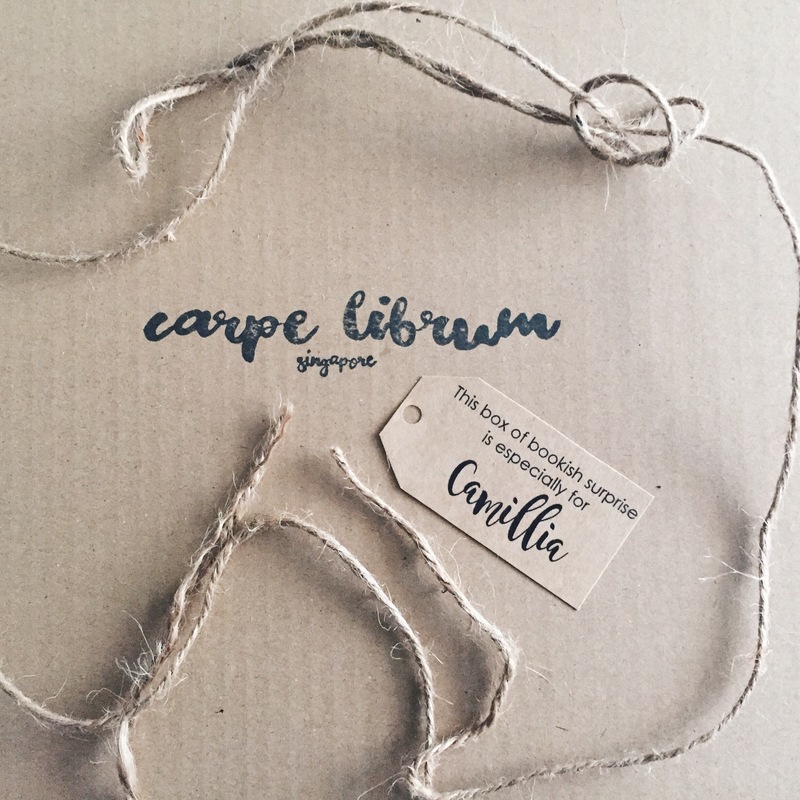 This month, Carpe Librum worked with madebysukma to put in a handmade leather tag. I really love it because you can tell it’s handmade but it’s still so beautiful. I can’t wait to use it! This was probably my favourite item this month. We got two little charms. One of an open book and another of a suitcase. They are both so adorable and even though I have yet to figure out where to put it, I’m already in love with it. We got travels bags! In the box, we were given four travel drawstring bags in different sizes. They are so adorable and practical. I know I will be using it for my next holiday. And till then, I might just use one of them to keep my makeup when I go out because they are just too cute! This month, we got a beautiful, handwritten postcard from the curator herself. 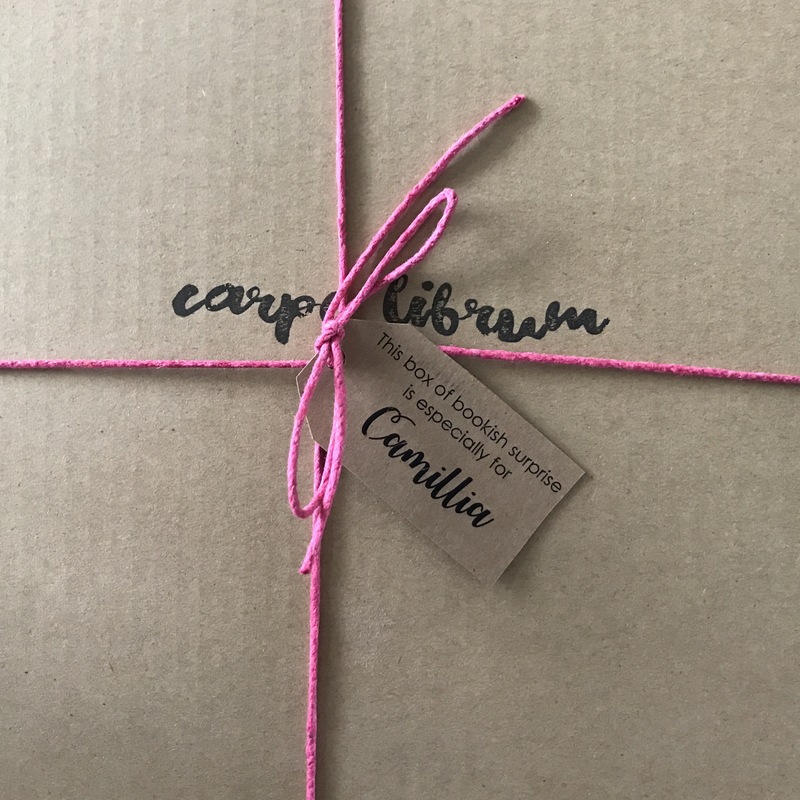 I’ve always loved how Carpe Librum personalises the things in their boxes and I really liked how they went a step further to make this box extra special. I mean I’m thinking of how many boxes they had to pack and to think that Azura actually sat down and wrote each of us a message just makes me so happy. So there you have it! 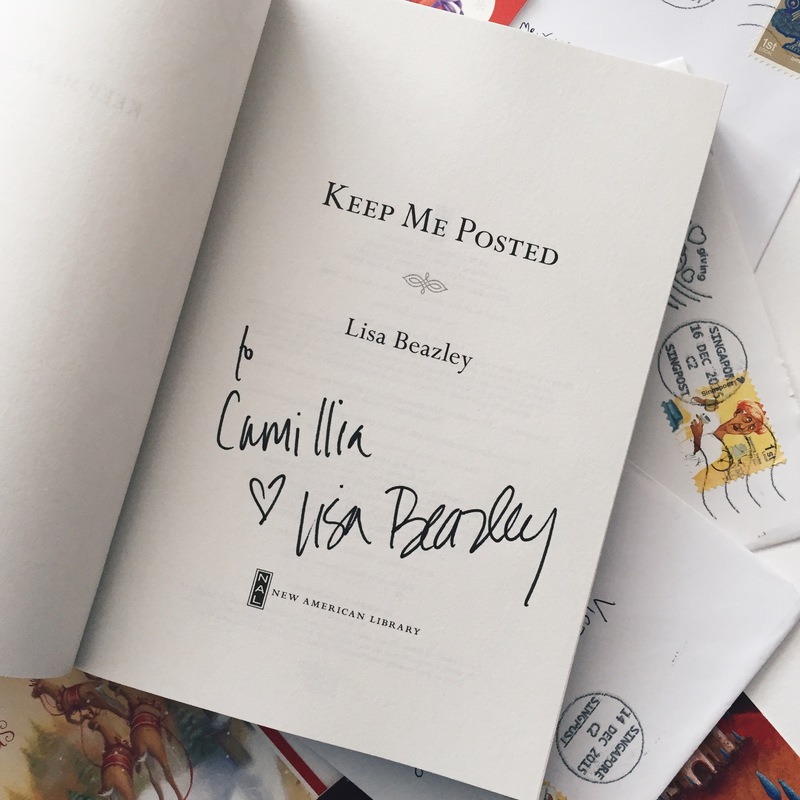 Everything that was in this month’s Carpe Librum Wanderlust book box. If their intent was to want to make us travel, let me tell you that they have completely succeeded. I’m always so impressed with Carpe Librum. With how hard they work, how lovely they are if you text them about not being able to receive the package and just how genuine they are. Hey guys! So last Monday, BooksActually announced that they were officially starting their new book subscription service! The second I heard about it, I knew that I needed it in my life because you know how I get about subscription boxes. So let’s break it down. With BooksActually, you pay for either 3, 6 or 12 month subscriptions. They are $129, $229 and $369 respectively (including local shipping). 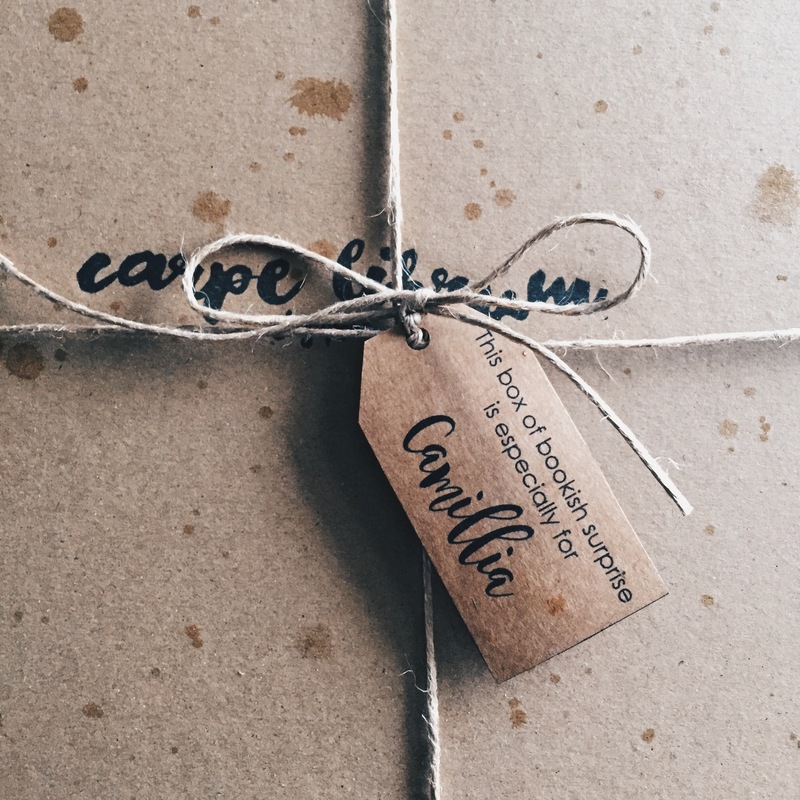 These boxes come every single month and they have a book as well as little bookish goodies. The best part is that BooksActually has seven Book Elfs or Curators and they let you pick which one you feel would best suit you. There’s really something for everyone with the different Curators and that’s one of the reasons why I really like BooksActually so much. I received my box last week and before I go into anything else, I have to say that I’m freaking impressed with the speed of their shipping. Mine took two days to arrive. The book that was included in the box this month was The Picture Of Dorian Gray by Oscar Wilde. Now I tend not to read a lot of classics so I was glad to know that I had yet to read it. I’ve also actually been wanting to read more classics, specifically this book, because I have a quote from the book up on my wall and I figure it’s probably good that I read the book if the quote is going to be up on my wall right? Not to mention that the edition of this book that BooksActually included is absolutely gorgeous! In this box, there was a medium sized drawstring pouch with an illustration of someone reading on it. 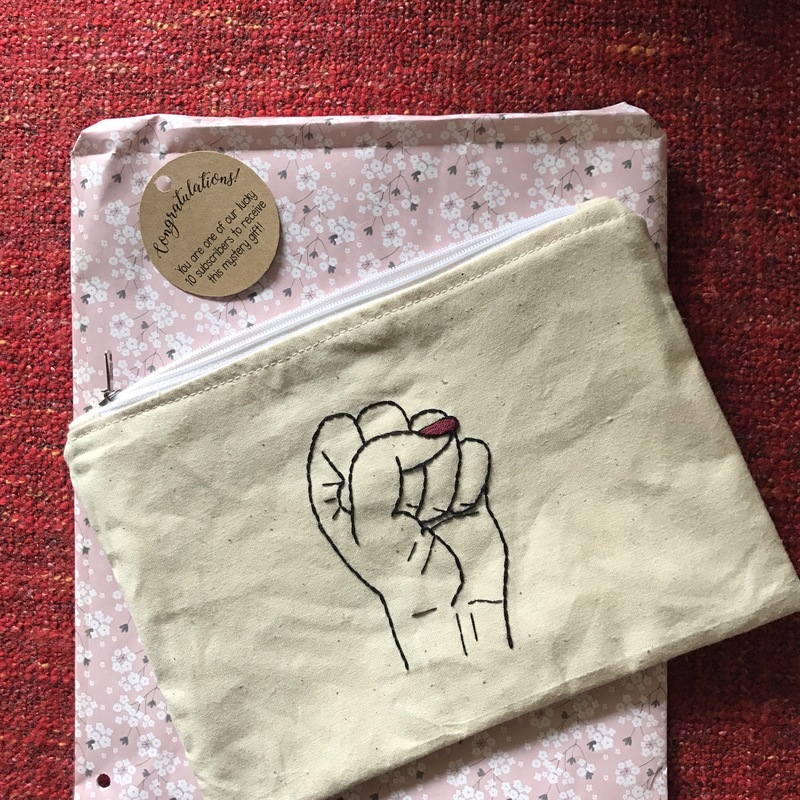 Now I absolutely adore the illustration but I have no idea what I’m going to use the pouch for. I mean if it were smaller I would use it for my makeup but it’s not. I guess I could use it to carry books around? Next up, is a lavender candle from Hush candle. This is my absolute favourite item in the whole box because it smells absolutely heavenly! Now if you know me, you would know that my go to has always been Yankee candles. I love them to bits. But I think this soy candle has revolutionised everything I’ve ever thought of scented candles. The scent is so strong but so incredible. It just fills your head and forces you to relax. Quite honestly, I’m just so impressed by it and even if you don’t get this box, go and buy this candle. It’s freaking amazing. Now this was rather interesting. There was an empty, rusted tin in the box. Now sue me for believing that when you pay for something you should actually get something. I honestly did not see the point of an empty tin. I mean I get that BooksActually is all about the aesthetic but sorry. That was a no go. Guys this was honestly the highlight of the whole entire box. I got some dead leaves. I mean seriously? 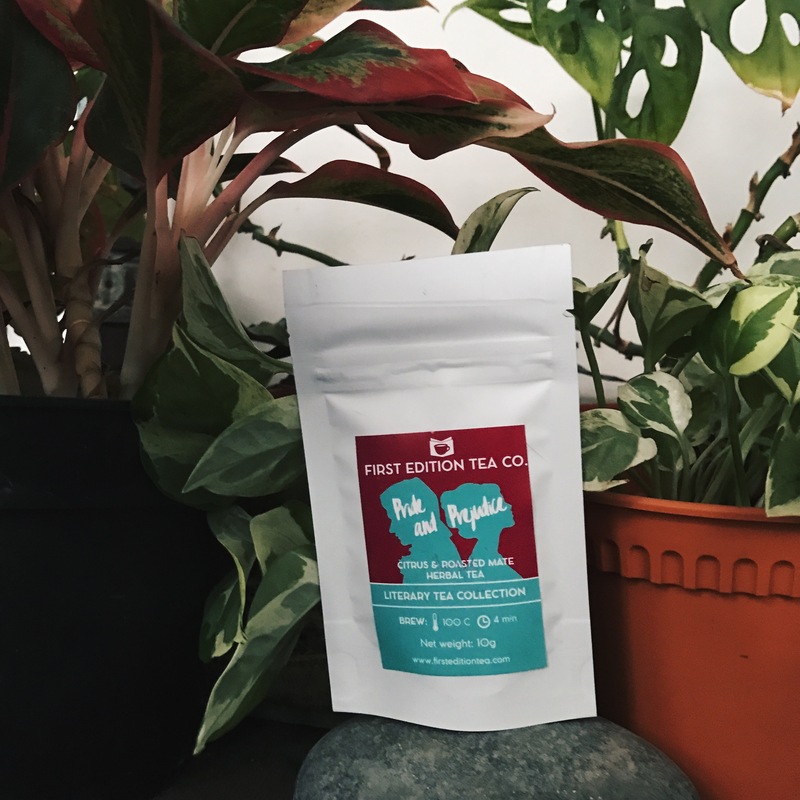 Where else can you find a subscription box that will give you dead leaves? I’m just so blown away by how creative they are. I can’t wait to use my dead leaves. It’s just going to make the whole reading experience so much better! So there you have it. That was everything that was in this month’s BooksActually box. I’m honestly really excited that Singapore is branching out (no pun intended) and getting more involved in the book world. I think it’s such a great step in the right direction. Hey guys! 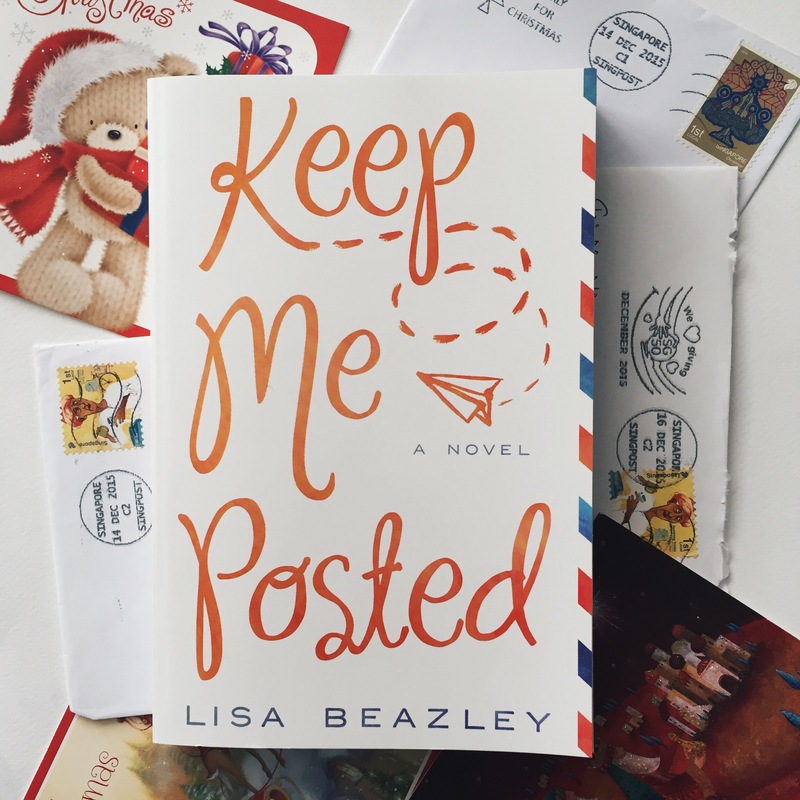 So a little while ago, I found out that there was a couple of wonderful ladies in Singapore who had decided that they, like the rest of us on this island, were tired of seeing other countries have amazing book subscription boxes while we had to either pay exorbitant shipping prices or simply have no way of getting it because international shipping wasn’t an option. 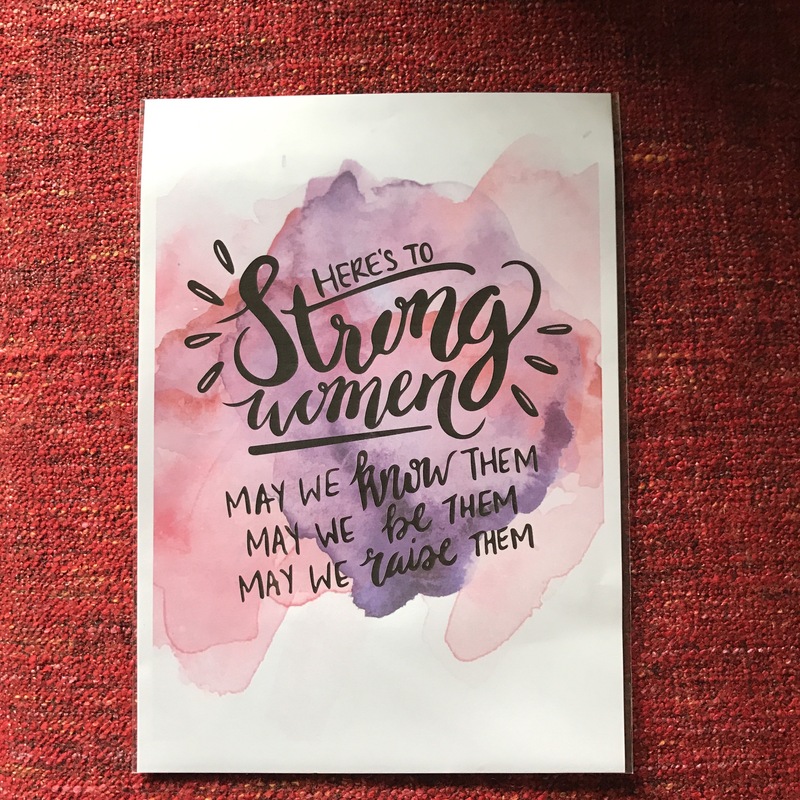 So unlike the rest of us, these women decided to do something about it and thus, the wonderful Carpe Librum was formed. 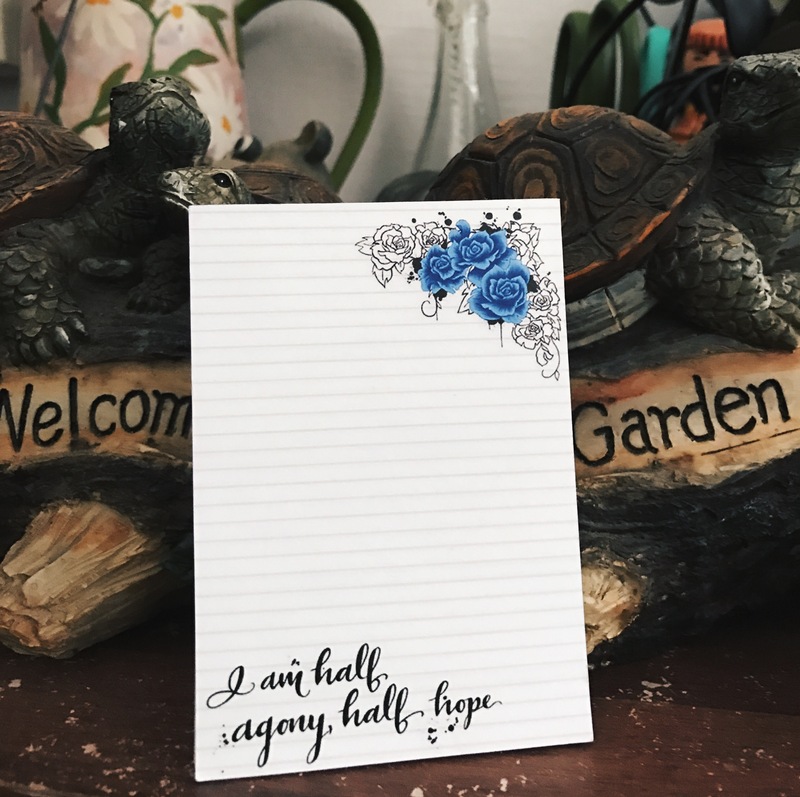 Carpe Librum is a bi-monthly book subscription service that costs $35 (including local shipping) and comes with a paperback novel and about five other little bookish goodies. Last week, my box was delivered and today I’m going to be unboxing it for you. I decided to wait a week mainly because I know some people didn’t get their boxes last week and I didn’t want to be the one to spoil it so I’m really excited to be finally getting to do it. This month, their theme is ‘Magic’ and everything in it was related to that theme (of course). So here’s what the box looked like in all it’s glory. It came with blue ruffly truffly paper which I thought was super cute and of course, each box had our names printed on the top in beautiful writing which was such a wonderful touch. But now they’re both adults, living in the hipster mecca San Francisco, and the planet is falling apart around them. Laurence is an engineering genius who’s working with a group that aims to avert catastrophic breakdown through technological intervention into the changing global climate. Patricia is a graduate of Eltisley Maze, the hidden academy for the world’s magically gifted, and works with a small band of other magicians to secretly repair the world’s ever-growing ailments. Little do they realise that something bigger than either of them, something begun years ago in their youth, is determined to bring them together–to either save the world, or plunge it into a new dark ages. 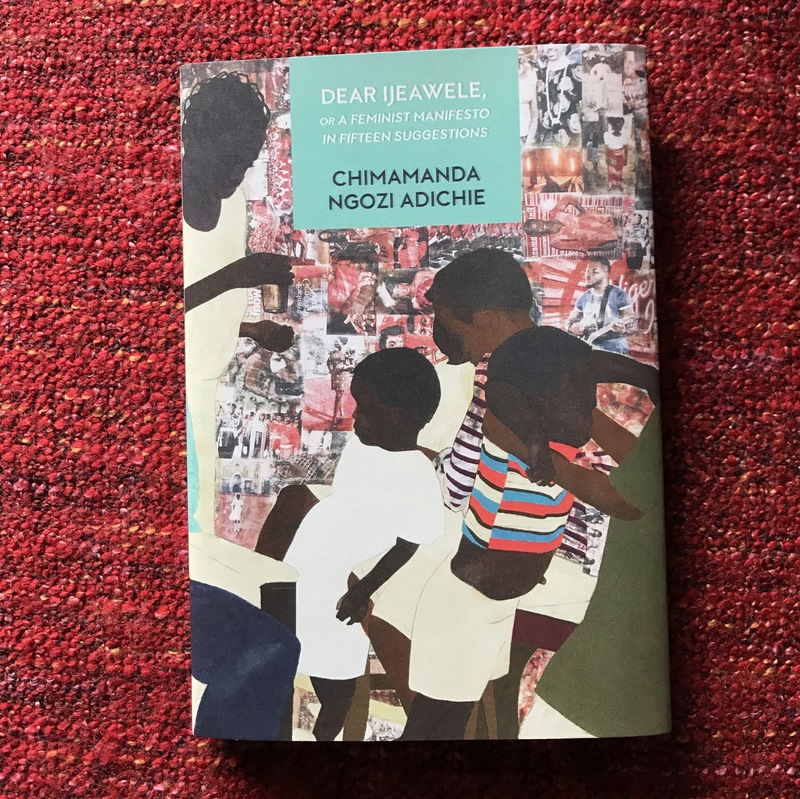 I have actually never heard of this book before which was completely fine by me because I love finding new books and reading stuff that I might never have picked up if it wasn’t quite literally shoved into my hands. I will be getting to this book as soon as I can and I will do a full review on it when I’m done. 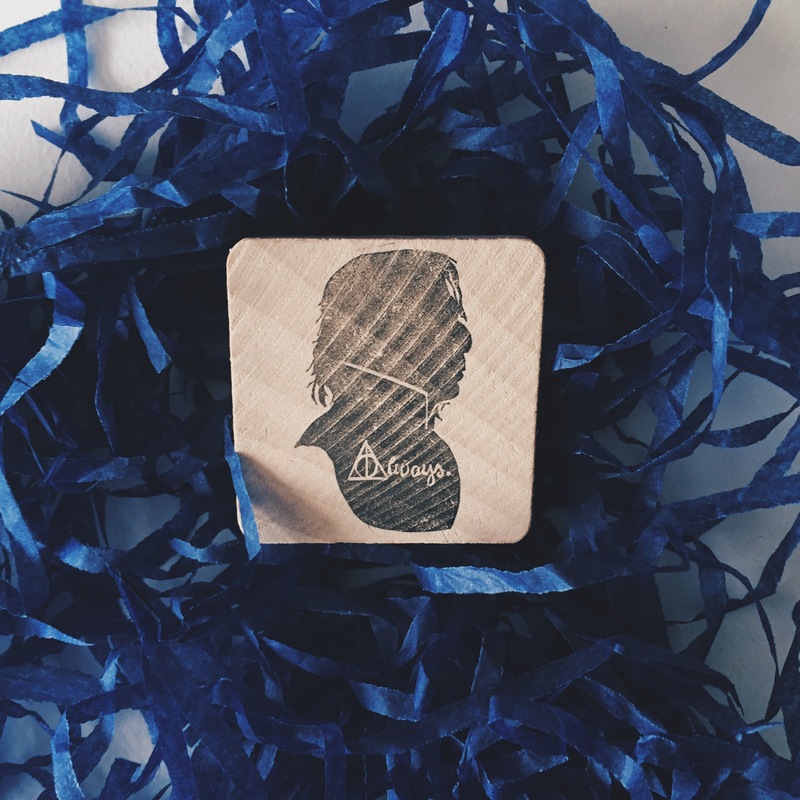 This is a Snape stamp that was made specially by Baisimu for this box. It was added into the mix in memory of Alan Rickman and I absolutely love it. 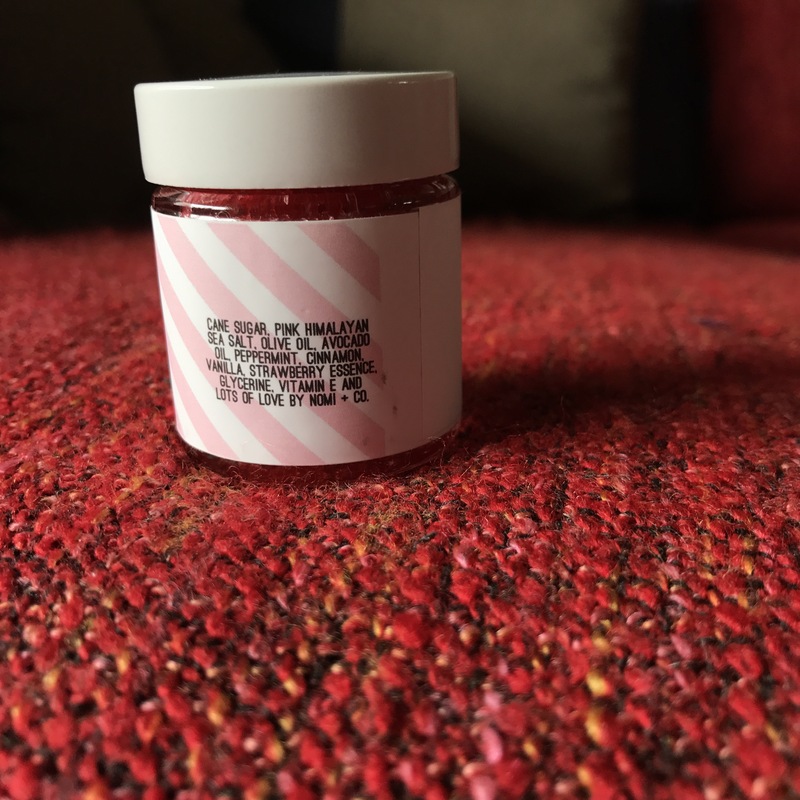 It comes with a little ink pad and it’s such a cute little stamp. My only problem is that I don’t really know when I’m going to get a chance to use it because I’m not a very arts and craft kind of person. This was probably my favourite thing in the whole box. It’s a little bracelet with a charm that has a crescent moon and a fairy sitting on it. It is honestly just so gorgeous and you can literally wear it with anything. My only issue is that I have tiny wrists and this bracelet is huge on me. A clasp so we could adjust the size might have been better but I really don’t mind too much. It’s just too gorgeous. In the box, there were two cards with quotes on them. They were both designed by Doodle It Write and I thought that they were so adorable. I have put both of them on my bookshelves and I adore how much it brightens it up. This was probably my least favourite item in the whole box. 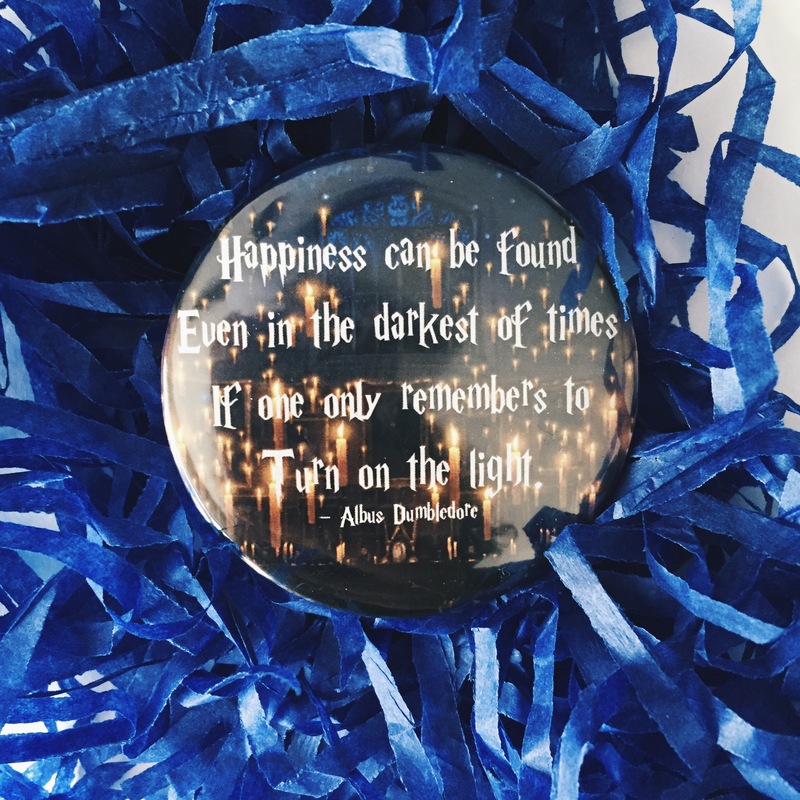 It’s a little button with a quote by Albus Dumbledore on it. Don’t get me wrong, I love the quote. I just didn’t like how the button was designed. The background makes the words hard to read and the whole thing just looks a bit crowded. That said though, I’ve put it on my shelves. It’s right on top of my Harry Potter books and it looks pretty good there. Overall I absolutely loved the box. Everything was just so on point and wonderful. I will certainly be getting the next box which a little birdy told me is going to be announced really soon. I simply can’t wait to see what they come up with next. If you’re a book lover in Singapore, please please please do support them. They are such lovely people and they really are so accommodating and efficient. Also we need to support the bookish culture in Singapore. 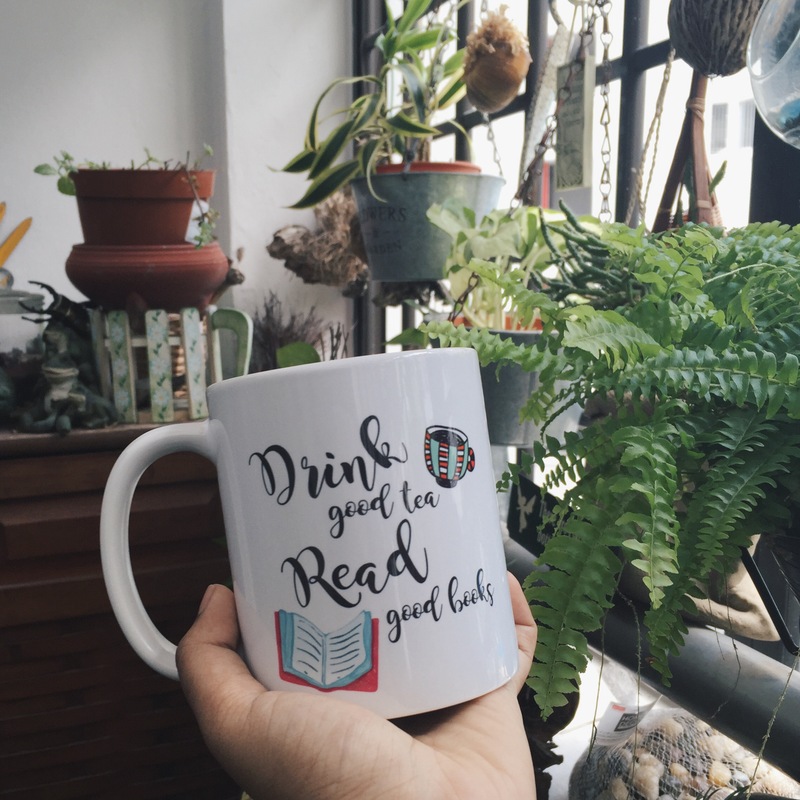 Everyone of us knows that Singapore isn’t as good as it should be when it comes to all things book related and so we really need to band together to support the little that we have. 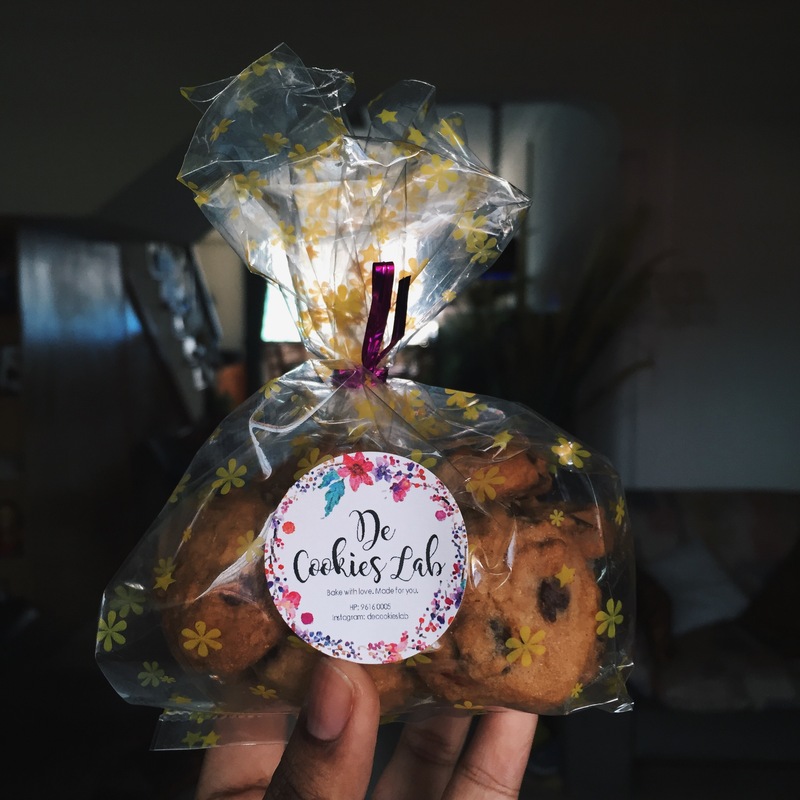 To find out more about them or to purchase a box, you can visit them on their Instagram page which is @carpelibrumsg or their Facebook at Carpe Librum SG.